Documentation and research are the core of every preservation project. We provide research services to construct thorough property histories, develop chain of title, and document building changes over time. Through field surveys, we generate measured drawings of buildings to serve as base drawings for condition surveys or architectural interventions. The quality of our work meets standards for HABS/HAER documentation and SHPO Guidelines for Historic Resource Surveys. Condition assessments are graphic documentation that record the existing material conditions of a structure and identify localized areas of deterioration. Through field surveys, we generate condition assessments of buildings and monuments, which are a first step in formulating plans for conservation treatments. We can develop a prioritized list of necessary repairs based on immediate, short-term, and long-term needs. In addition we can provide repair budget numbers for planning purposes. Historic Structure Reports form a foundation for preservation planning efforts. We offer archival research and report-writing services to document history, materials, existing conditions, and significance of historic structures. 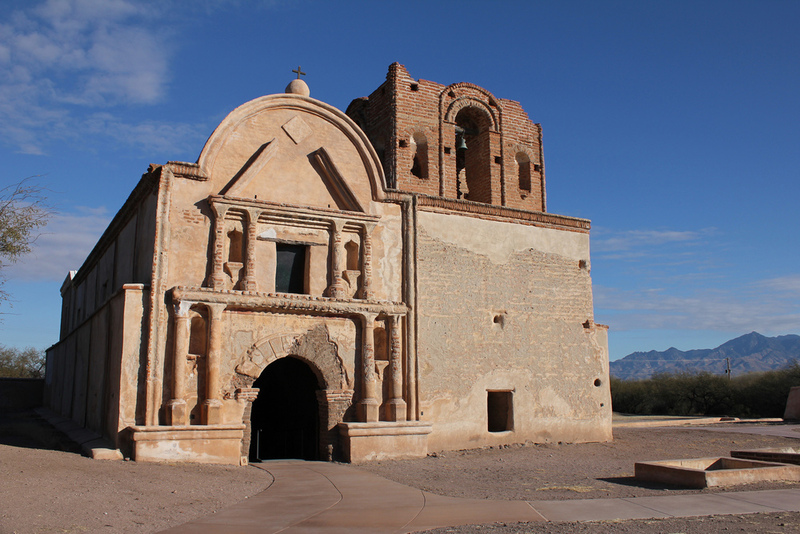 Listing on the National Register of Historic Places provides recognition for significant historic buildings, as well as opportunities for certain preservation incentives. We perform research and compose National Register nominations for historic property owners. Federal and state tax credits can help defray the cost of major historic preservation projects. Tax credit projects require extensive documentation of existing buildings and architectural interventions. We offer guidance through the tax credit process and assistance in completing the necessary documentation to secure tax credits. The study of the historic finishes provides a record of early color schemes and alterations to the building over time, and can inform the selection of restoration colors. Finish studies will result in a complete report with photomicrographs of paint cross sections in both reflected and ultraviolet light. Color matching to modern paint lines and pigment identification are also available upon request. The analysis of historic materials aids in the selection of mechanically, chemically, and aesthetically compatible repair materials. In addition, laboratory and in-situ analysis can help identify causes of deterioration. Our lab is equipped for petrographic and wet-chemical analysis of mortar, stucco, and plaster materials. We also formulate replication mixes for masonry restoration and carry out a variety of tests to study the properties of historic materials to determine the most appropriate interventions. Our conservators take on the implementation of small scale, specialized conservation treatments including consolidation of finishes, plaster, and stone; composite repair and injection grouting of voids and cracks in masonry and cementitious materials; and masonry cleaning. Consolidation is the treatment of a stone, mortar, or ceramic with a material to restore the mechanical properties after they have been degraded by weathering. Before undertaking a conservation program involving consolidation or cleaning, it is imperative to perform testing and/or mock-ups to determine the most appropriate products and application methods. We perform consolidation and cleaning tests in the field and in the laboratory. Paint microscopy begins with an on-site investigation and removal of paint samples. Sample locations are selected through careful examination of the building, sometimes combined with archival research, to determine sample locations that will provide the most useful information about the paint history of the building. Exposures using mechanical or chemical means is often helpful to determine the best sample locations. This tool is also useful in the later stages of a paint study for confirming findings observed in cross-sections, uncovering decorative painting schemes, and matching historic finishes to modern paint lines. After an on-site sampling, paint samples are brought back to the Meadors laboratory for examination, processing, and analysis. 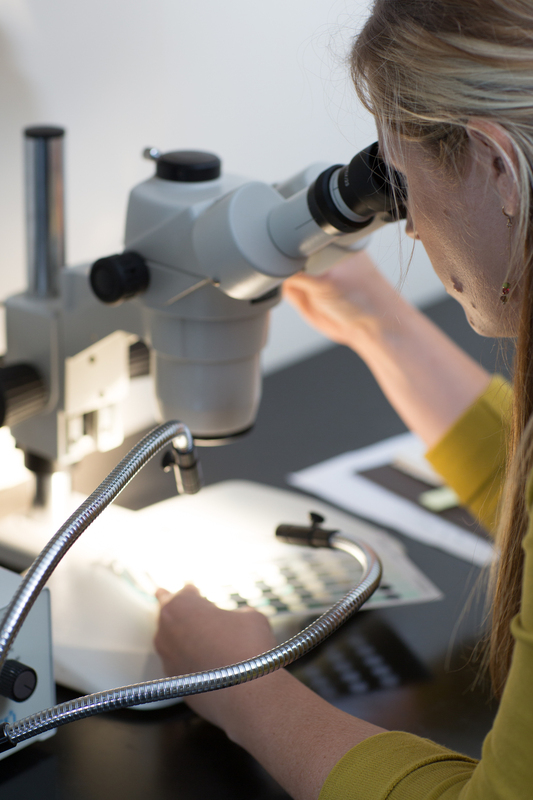 Following examination with a low-power stereomicroscope, the most intact samples are selected for analysis. Samples are cast into resin cubes, cut into cross-sections, polished, and mounted onto microscope slides for analysis. Microscopic analysis of paint cross-sections is performed with a compound fluorescence microscope with magnifications ranging from 40-400 times. Cross-sections are examined and photographed in both reflected and ultraviolet light. The use of ultraviolet illumination provides information that cannot always be gleaned from reflected visible light alone. Ultraviolet light can help identify varnishes and shellacs, binder types, and pigments through autofluorescence and staining. It can also help distinguish between sequences of paint layers that might not be easily differentiated in reflected light. The result of paint analysis is a well-documented report with photomicrographs of each sample in both reflected and ultraviolet light. Physical and chemical analysis of historic mortars, stuccos, and plaster is an important part of architectural conservation. Although the creation of these materials has become standardized today, the formulations used during the original construction of many historic structures were highly variable and depended on the individual mason or plasterer making it necessary to perform such laboratory testing on each specific rehabilitation project. The goal of an analysis is to determine the original components and formulations of the material as well as understand the possible causes for deterioration and failure. Testing begins with sampling on site in order to obtain materials for laboratory testing and assess the current deterioration conditions. Following on-site sampling, mortar and render samples are brought back to the laboratory and are categorized visually under a microscope with visible light to describe the texture, appearance, and color. Depending on the level of analysis necessary, samples are can be analyzed petrographically and/or tested using wet-digestion methods. During acid digestion, calcareous materials such as lime are dissolved while the insoluble portions like quartz aggregate and clay fines remain. Percentages of each are calculated based on the original weight and the aggregate is sieved to determine the range of particle sizes in the original material. At the end of analysis, the data is interpreted in order to determine the historic formulation and make recommendations for an appropriate replication mix. A report labeling all sampling, testing, and recommendations is produced and can then be given to a qualified mason or plasterer to use on a specific project. Consolidation and cleaning are two common methods employed to conserve and protect historic stone masonry and terra-cotta. Cleaning of historic materials involves safely removing years of pollution and biological growth from the surface of the stone to dramatically reveal original finishes and surfaces once hidden beneath layers of dirt. When a stone requires the impartation of additional strength without the insertion of pins, a consolidant is typically applied to the surface of the stone. Prior to any action, it is essential to understand the mechanisms behind deterioration in order to alleviate them prior to treatment. Analysis begins with a characterization of the stone through petrographic analysis and materials research. Historic photos provide an excellent estimate of deterioration rates. Samples are created from the original or a facsimile, and the product is applied to the sample according to manufacturer’s instructions and left to cure. Similar products are applied in order to allow for comparison.